OLYMPIA — More than 3,000 Washingtonians will receive more than $7.6 million in debt relief from Career Education Corporation (CEC), a for-profit higher education company, as part of Attorney General Bob Ferguson’s legal action over the company’s use of deceptive practices to attract potential students. CEC owned and operated two campuses in Washington until they closed down. The most debt relief an individual Washington student will receive is $59,000. The median amount of debt relief is $1,463. In addition to debt relief and other injunctive terms, the company is legally required to disclose to prospective students accurate information about cost, graduation rates, job placement rates and median debt for graduates. Career Education Corporation (CEC), headquartered in Illinois, has owned several for-profit schools, including Le Cordon Bleu, Briarcliffe College, Brooks Institute, Brown College, Harrington College of Design and International Academy of Design & Technology (later known as Sanford-Brown). The company now only operates American InterContinental University (AIU) and Colorado Technical University (CTU). Washingtonians who attended a CEC institution that closed before Jan. 2, 2019 will receive relief from institutionally held student loans issued by CEC. Washingtonians whose final day of attendance at CEC’s two remaining schools, AIU or CTU, occurred on or before Dec. 31, 2013 will also receive relief from CEC-issued loans. By that date, CEC had already changed many of its misleading practices at those two institutions. Students do no need to take any action to receive relief. CEC will notify all eligible students of their debt relief within 60 days. Former students with questions about their eligibility may contact CEC by calling 844-783-8629 or emailing CECquestions@careered.com. CEC misled students about the total costs of enrollment at its institutions. The company did not disclose that some of the programs lacked the necessary professional accreditation, leaving students unable to obtain employment or the licensing they needed to continue in their fields. The company also misrepresented the job placement rates of past graduates. When calculating job placement rates, CEC included graduates who only worked temporarily — even as little as one or two weeks — or were employed in a field unrelated to their degree. CEC told students that credits from their institutions could be transferred to other institutions. In reality, it was very difficult or impossible for students to transfer to a non-CEC school. In several consumer complaints to the Attorney General’s Office, former CEC students reported that the company did not disclose that their credits could only transfer to other CEC schools. As a result, some complainants took out student loans for degree programs that they were unable to finish, either at CEC or at another institution. Students incurred debt as much as $50,000 in some cases. The company owned two physical locations in Washington, both located in Tukwila: a Sanford-Brown campus, previously known as the International Academy of Design and Technology, and a Le Cordon Bleu campus. Both schools stopped taking new students in 2015 and have since closed down. Some Washingtonians may still be attending CEC schools through online programs. Today’s resolution is a result of a multistate investigation into CEC’s deceptive and misleading practices. Washington and 47 other states investigated the company’s recruitment practices and found that CEC misrepresented the cost of attendance, graduation rates, expected future salaries for graduates and job placement rates. CEC will forgo collecting more than $493.6 million in debts owed by nearly 175,000 students nationwide. Provide a risk-free trial period of 21 days for online programs and 7 days for on-campus programs, if they have less than 24 college credit hours when starting the program. Assistant Attorney General Craig Rader handled the case for Washington. Former CEC students with questions about this relief may contact CEC directly by calling 844-783-8629 or emailing CECquestions@careered.com. He also has recovered almost $1.5 million cracking down on debt adjustment companies that charge fees to help borrowers consolidate their federal student loans and enroll in income-driven repayment plans — tasks that borrowers’ loan servicers can and should help them with for free. More information on the office’s student loan work is available here. 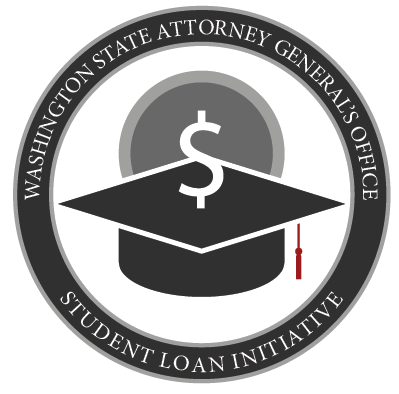 To assist student loan borrowers in Washington, the Attorney General's Office has compiled a Student Loan Survival Guide. This guide provides tips and links to resources to help high school students thinking about attending college, former college students who are not able to keep up with their payments, parents of students and everyone in between.